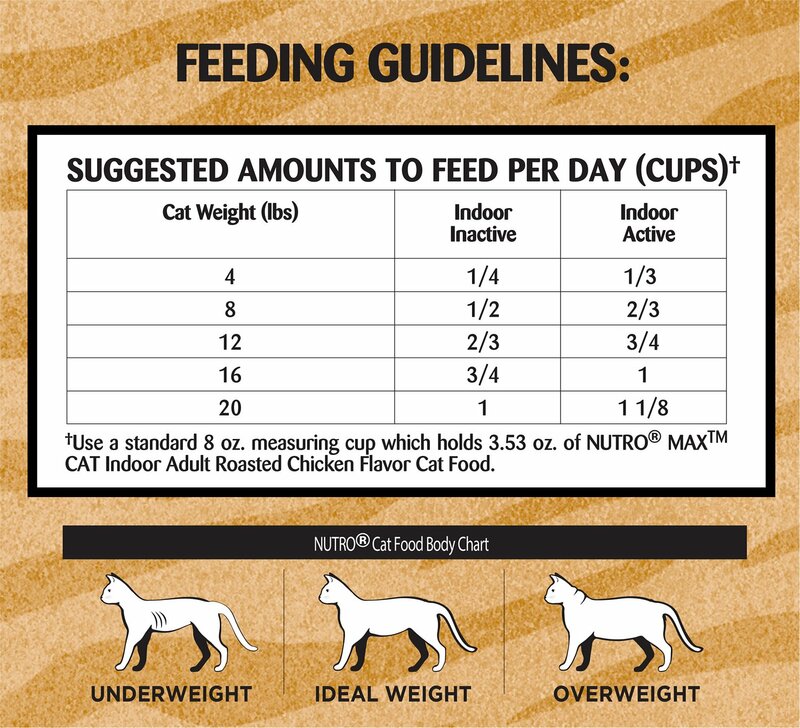 Give your kitty the nutrition he craves and thrives on with the Nutro Max Indoor Adult Roasted Chicken Flavor Dry Cat Food. Made with chicken as the first ingredient, it packs plenty of animal-sourced protein to fuel all those indoor adventures. The formula is loaded with antioxidants for a healthy immune system, essential taurine for vision and heart health, omegas for a shiny coat, and a balanced blend of vitamins and minerals. Plus, it’s formulated with a kitty-approved flavor and kibble shape that’ll have your pal running to his bowl every time. 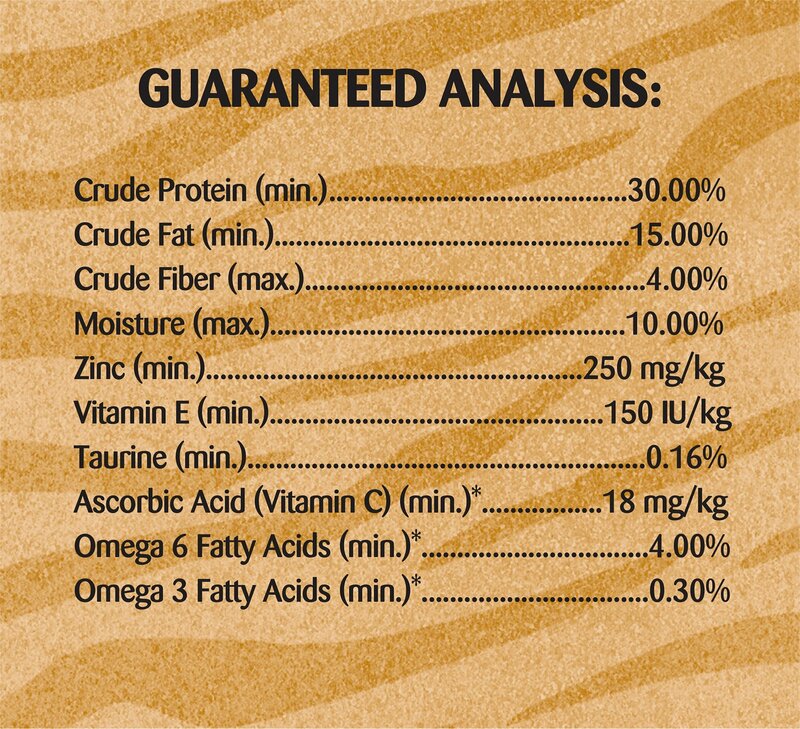 Indoor kibble is made with chicken as the first ingredient for the high-quality animal protein cats need. 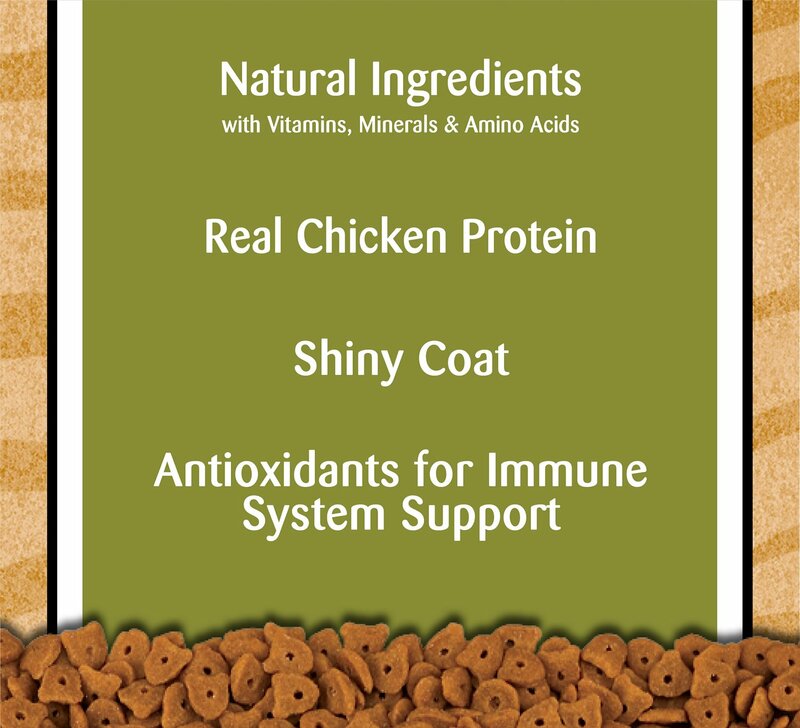 Unique kibble shape and delicious flavor is great for picky eaters, and provides a 100% complete and balanced diet for adult cats. 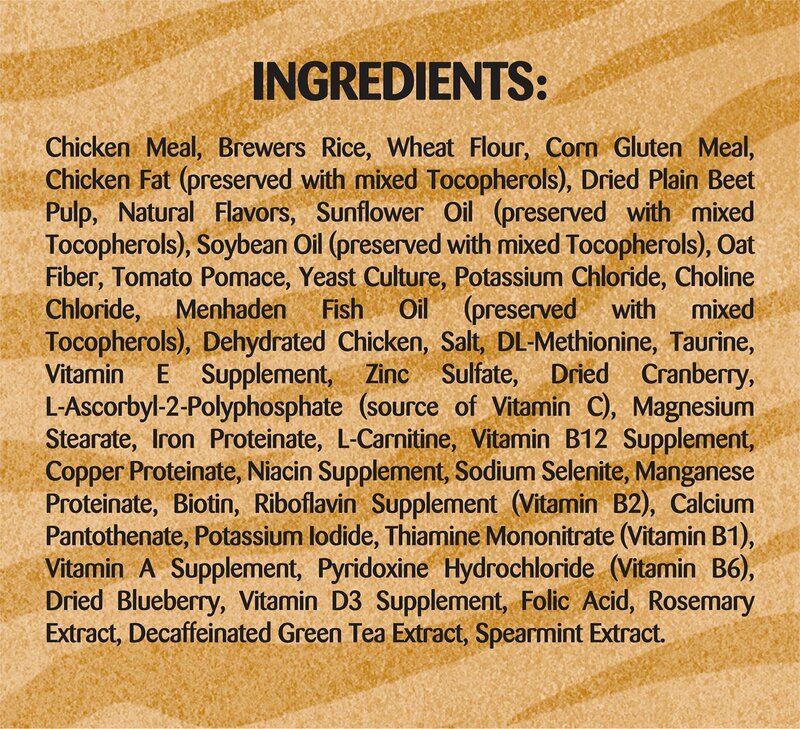 Chicken Meal, Brewers Rice, Wheat Flour, Corn Gluten Meal, Chicken Fat (Preserved with Mixed Tocopherols), Dried Plain Beet Pulp, Natural Flavors, Sunflower Oil (Preserved with Mixed Tocopherols), Soybean Oil (Preserved with Mixed Tocopherols), Oat Fiber, Tomato Pomace, Yeast Culture, Potassium Chloride, Choline Chloride, Menhaden Fish Oil (Preserved with Mixed Tocopherols), Dehydrated Chicken, Salt, Dl-Methionine, Taurine, Vitamin E Supplement, Zinc Sulfate, Dried Cranberry, L-Ascorbyl-2-Polyphosphate (Source of Vitamin C), Magnesium Stearate, Iron Proteinate, L-Carnitine, Vitamin B12 Supplement, Copper Proteinate, Niacin Supplement, Sodium Selenite, Manganese Proteinate, Biotin, Riboflavin Supplement (Vitamin B2), Calcium Pantothenate, Potassium Iodide, Thiamine Mononitrate (Vitamin B1), Vitamin A Supplement, Pyridoxine Hydrochloride (Vitamin B6), Dried Blueberry, Vitamin D3 Supplement, Folic Acid, Rosemary Extract, Decaffeinated Green Tea Extract, Spearmint Extract. This one is a bit hard to review but thought I would throw it out there for other people to be aware of. My two cats, who eat pretty much anything, refuse to eat this food. I honestly have no idea why, it seems fine. It is not spoiled, it doesn't smell odd, and the kibble is normal sized. One cat will begrudgingly eat it as opposed to starving, the other will try to steal the dogs food. Neither of my cats are picky eaters, so if your cat is, I would suggest starting with the small bag. I am not sure what to do with this 16lb bag of food I bought. My 6 month old rag doll is transitioning over to adult food and is doing great with this food. I wondered why I ordered such a large bag in case he didn’t like. He does! 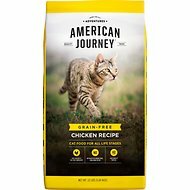 I have not tried my kitties on this particular flavor before, but I imagine that they'll love it like they love the regular chicken and salmon flavors. I have 3 cats. One of which regurgitates everytime she eats. She was a stray that we had found and believe life before us wasn't very happy. Bc I always noticed she would gorge herself and then moments late I was cleaning it up. After trying so many different foods I had began to give up on this situation and except I would be cleaning up after her for the rest of her life. And then the amazing miracle happen when I purchased Nutro Max....she would eat and it stayed down. Oh my what a relief and my 2 other cats love the food as well. So, it has been a win win for my precious cat and my family. 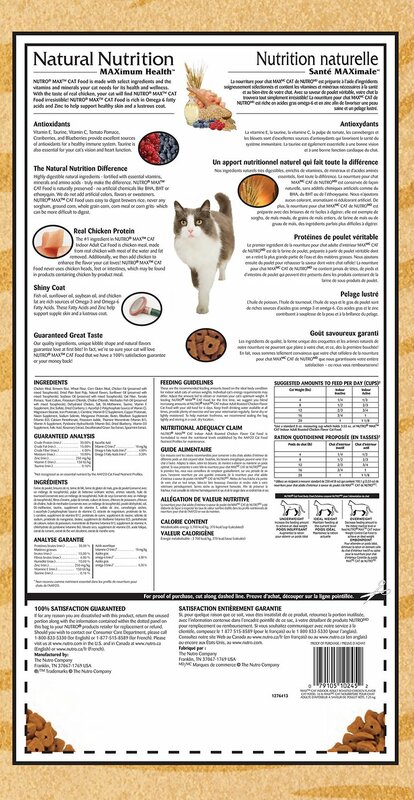 Is a great food all my cats enjoy while still meeting the requirements for my cat with kidney issues. I ordered this for my mom's cat. He loves it. Plus, it a large bag for a pretty decent price and seems like a decent quality food for him. 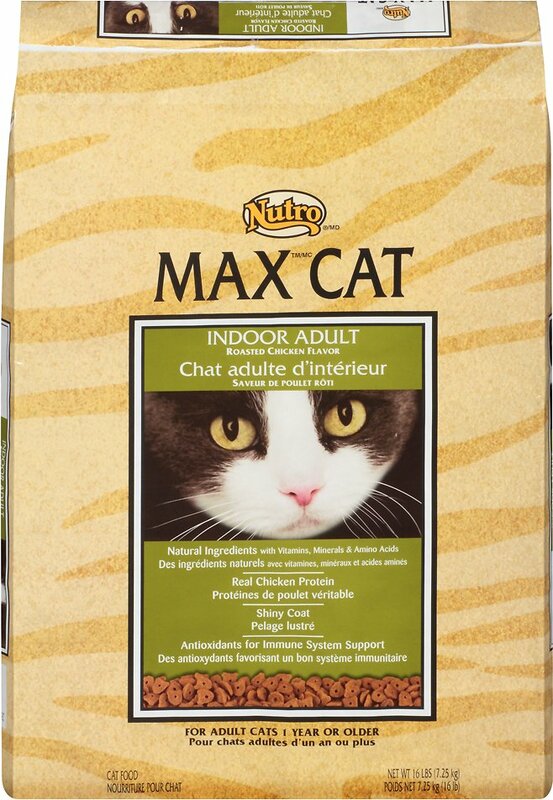 My cats like this dry cat food. Not too small or large so it is easy for them to eat. Have been feeding my cat the regular chicken Max Cat, and now trying her on the indoor one. I mixed it half in with the regular one and she eats it up just fine.